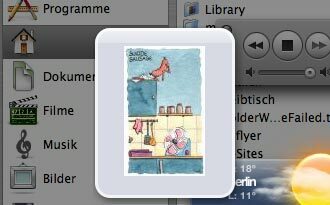 cartoons, pimp your Windows Vista / Mac OS X machine. Bring your favorite selection of toonpool.com cartoons with this convenient little gadget on your website, blog or myspace page. You can edit the coloration to suit it to your needs. 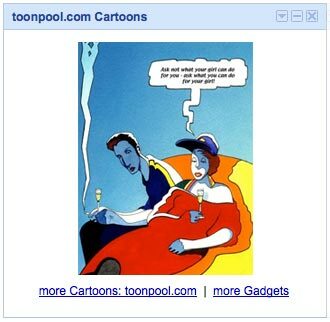 Place the toonpool.com Gadget on your personal iGoogle website for the daily laugh. No matter if you're one of Steve Jobs' or Bill Gates' homies: download the fancy toonpool.com Gadget/Widget for Windows Vista or Mac OS X 10.4.3+ and watch the latest cartoons conveniently without starting any browser. Note for Mac users: Mac OS X 10.4 Tiger is required. If you're using Safari, click the download link. When the widget download is complete, Show Dashboard, click the Plus sign to display the Widget Bar and click the widget's icon in the Widget Bar to open it. If you're using a browser other than Safari, click the download link. When the widget download is complete, unarchive it and place it in /Library/Widgets/ in your home folder. Show Dashboard, click the Plus sign to display the Widget Bar and click the widget's icon in the Widget Bar to open it. Please visit the toonpool.com Gadget thread for bug reporting and discussion.